A lot of people believe that sugar is great flower food, but it isn't. The same goes for lemonade. It's only an extra source of bacteria which you want your flowers to stay away from. Just stick with cut flower food provided with your bouquet. This contains every nutrient that your flowers need. Although bleach stops the growth of bacteria and helps with damaged stems people generally use too much of it. Only a tiny drop is enough but it's best to stay away from bleach. The flower food provided with your bouquet contains enough to help keep any bacteria at bay. I cringe whenever I hear this one. This is 100% a myth and a definite no no. By bashing the stems you are actually damaging the stem cells which prevents the flowers from absorbing all the nutrients and water. What you should do with all flowers is use a very sharp knife or scissors and cut the stems at a sharp angle thereby increasing the surface area which helps the flower drink. We all love a bit of sun and warmth. Me in particular! Flowers do too but placing them in sun speeds up the opening time of the flowers which shortens their vase life. Flowers kept in the cool last a lot lot longer. My closest friend keeps her flowers in the front hall and they last at least a month. And I've known customers place the flowers outside in the porch over night and bring them in again during the day. Just not recommended if there is frost in the air! This is partially true. It's best to remove all leaves that would end up below the water line in a vase. By doing this you will prevent rotting and extra bacteria in the water. But keep the rest of the leaves and thorns on. The leaves will improve the water uptake and make your bouquet look nicer (with the exception of contemporary designs). If you cut off the thorns you create little wounds which will contaminate the vase water. Copper does have anti-bacterial properties but copper pennies don't dissolve in water. So adding pennies to the water does not have any positive effects on the vase life of the flowers. Because pennies and other coins contain a lot of bacteria it will actually have a negative effect on the vase life. 1. Our bouquets generally come in a bubble of water in a box. 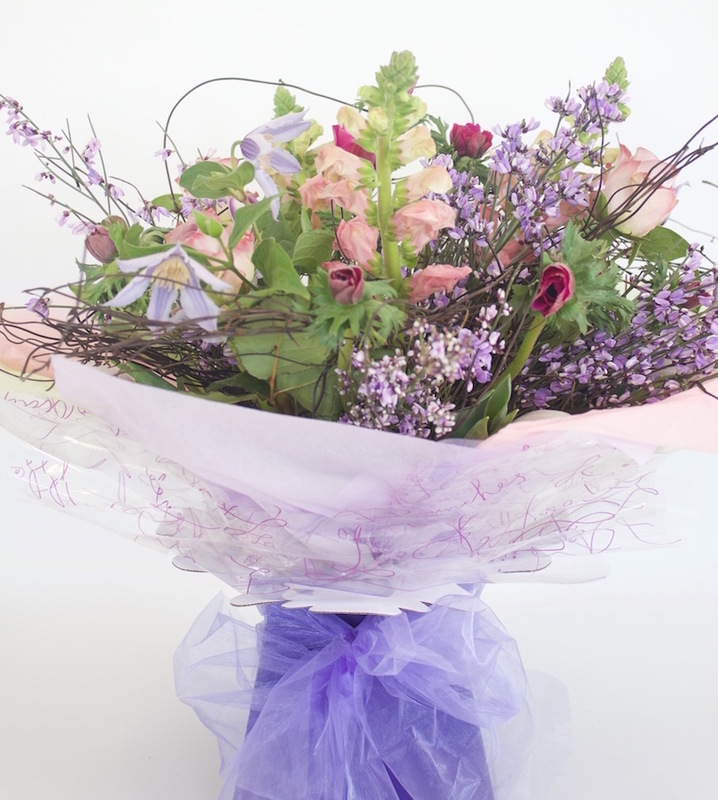 You can keep your bouquet in the presentation box if you wish but we would recommend only for a couple of days. By then the water level could be very low and it will need replacing with clean fresh water. 2. Use the cut flower food provided with your bouquet. Our sachets contain enough for 1 litre of water. Use a clean vase and clean tap water. 3. Remove the flowers from the box and hold over a sink while you remove the bubble of water. You can keep the rest of the packaging if you wish but we would recommend you remove this too to allow the flowers to breath and air to circulate. 4. Re-cut the stems with a sharp knife or sharp pair of scissors. Cut the stems on an angle. By using blunt scissors you will actually be strangling your flowers! This is because you will be blocking their cells and uptake of water will be restricted. 5. Completely change the water every couple of days and add more flower food. If you don't have any spare in your cupboard please call into the shop and we'll give you more. We care about our flowers! 6. Keep the flowers away from the fruit bowl. Ethylene gas is released by fruit, especially bananas, which in turn ages your flowers at a faster rate. If you follow these easy rules you should be able to enjoy your flowers for a week or two. Sometimes more!